Sometimes, the chlorine in a swimming pool can damage your hair - especially if it’s color-treated or already needs moisture. But we’re here to help! We’ve put together this list of the top ten swim caps that keep your hair dry so that you can swim without worrying. You can have some fun in the sun no matter how long your hair is! Before we get started, here are some things you should know about swim caps. 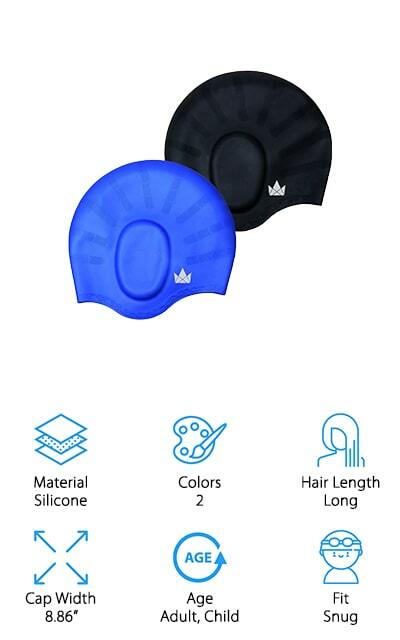 Material: Swim caps are meant to hold tight to your head to block any water from getting to your hair. Because of this, they are usually made of stretchy, rubbery materials like silicone and nylon. Choose your favorite! Colors: This is the number of colors that the caps are available in. We’ll add more details in the review, Choose a color that you’re going to love so you have a cap that you’re happy to wear! Hair Length: How much hair will the cap cover? This information will tell you if it’s the right choice for you based on the length of your hair. Some caps can’t handle long hair, so keep this in mind. Cap Width: How wide is the cap at the widest point? This can affect how snugly it will fit on your head. Each person’s head is different, so take measurements to make sure that it’s going to fit you alright. Age: Is this a cap for an adult or a child? This will affect the size and how it will fit. Some caps are made for both, so that one size fits most. Keep this in mind when you order. Fit: Does it fit snug or is it lose? This depends on a number of factors, including the size and shape of your head. This will tell you how it should fit on a standard head. Now that you know a little more about swim caps, we can start showing you the products! Our top pick and budget pick our favorites, but you should definitely check out the rest of the caps on our list. We’ve done our research to bring you only the best caps, so you don’t have to do any additional research - we already did it! Now you can go swimming without worrying about ruining your hair! 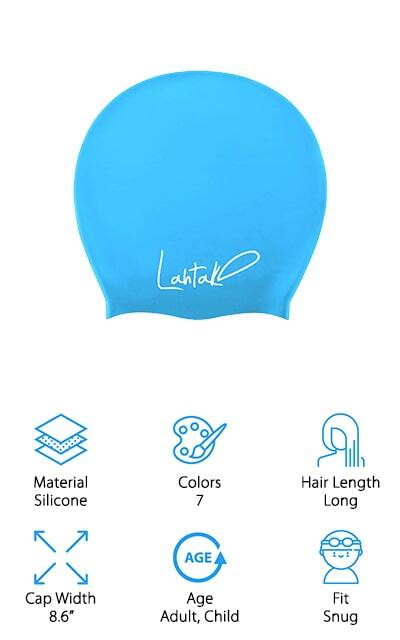 One of the best swim caps to keep long hair dry is this one from Lahtak. This is an extra large cap so that you can keep braids, curly hair, dreadlocks, and longer hair tucked up and away from the water. If you have a child with long hair, you can choose the downsized version. It will still protect your hair from water and the harmful effects of chlorine. While it secures your hair down snugly, it’s overall a loose-fitting design that will be comfortable and won’t press your bun to your head while you’re wearing it. They say that it’s just as tight as a headband! By squeezing the air out of the cap you can get a tight seal that will keep your hair mostly dry. It’s durable and won’t rip on you the first time you put it on - or even when you take it off. You’re going to love wearing this comfortable swimming cap! This swim cap by the legendary Speedo is made of silicone, so it’s easy to put on and take off without snagging your hair or tearing the cap. It stretches out to fit all different hair lengths. It’s lightweight and fits comfortably because it’s made of a lightweight silicone instead of a heavier material. Though it has a width of between 21 and 25 inches, you can easily stretch it out to twice its size to cover all of your hair, including dreadlocks and curls. 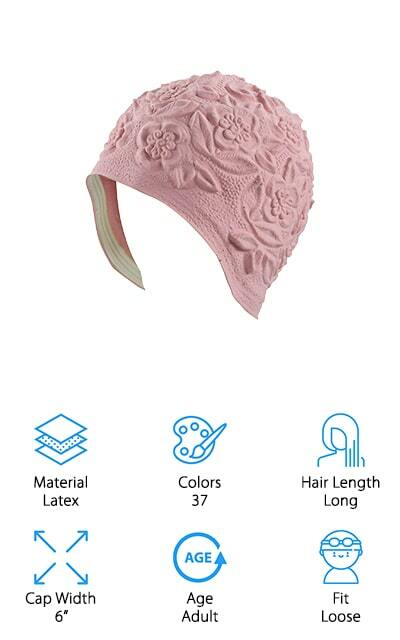 This soft cap is one of the best swim caps to keep your hair dry because of the stretch and sealing technology. It’s also wrinkle-free, so if you’re swimming to beat a time, this is the best cap for it. It won’t drag like some other caps to slow you down. When you want something that will stretch and be durable without being uncomfortable, this is the best cap for you! These caps by The Friendly Swede are great for both adults and children, and just about any hair length. They are durable because they’re made of silicone and not latex or any other flimsy material. They are unisex and can also be used for children. When you need a cap that isn’t going to snag your hair, as well as one that’s going to keep your long hair dry and tucked away, this is the cap you should reach for. THey prevent overpressurizing within the cap and help to keep water away from your ears. Avoid swimmer’s ear with these comfortable ergonomic ear pockets. The caps won’t wrinkle, which means that you’re going to swim faster because there’s no drag through the water. We love that this cap isn’t going to pull at your hair when you take it off, which is especially nice for long, thick hair. This cap can be used for anyone! 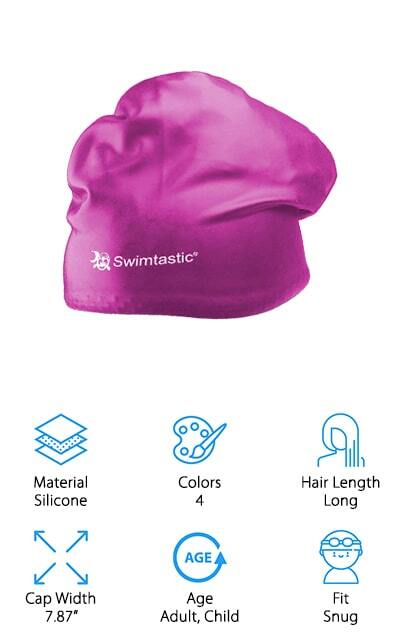 Swimtastic makes this silicone swim cap that’s equipped with extra room for long hair or specific thick hairstyles. Your hair won’t tangle while you’re swimming, which is one of the main problems from swimming with long hair. You get some extra room in the cap, so you can easily tie your long hair up and away without getting it wet. It’s resistant to tears, and it won’t snag your hair when you take it off either! It’s a comfortable cap that comes in a few colors, including purple and pink. That makes it a great swim cap that keeps your hair completely dry for adults and children, no matter the gender. Even thick or curly hair will be protected and perfectly stowed away with this cap! It fits snug and creates a powerful seal that will keep your hair right where it belongs without the risk of chlorine damage or tangles after you are finished in the pool! 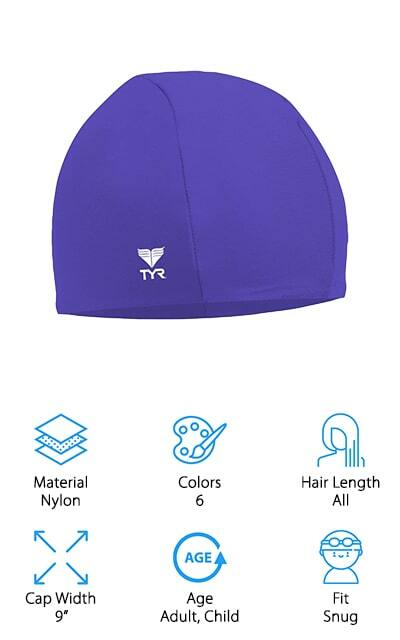 TYR makes this Lycra swim cap to keep long hair dry. You can use it for all hair lengths, and for adults and children as well. It’s made of 80 percent recycled nylon, which makes it environmentally friendly as well. It fits snugly around your head without pulling your hair or snagging on things, especially when you take it off, Plus, it won’t break or snap when you’re taking it off no matter how hard you pull. It’s fitted to reduce drag in the water if you happen to be competing in any races. However, this cap was designed to help the recreational swimmer have a better experience. We love the different colors this cap is available in, and that combined with the materials and comfort this cap affords makes this one of the greatest swim caps that keep your hair dry on our list! Try it out today and enjoy hassle-free swimming for your hair. 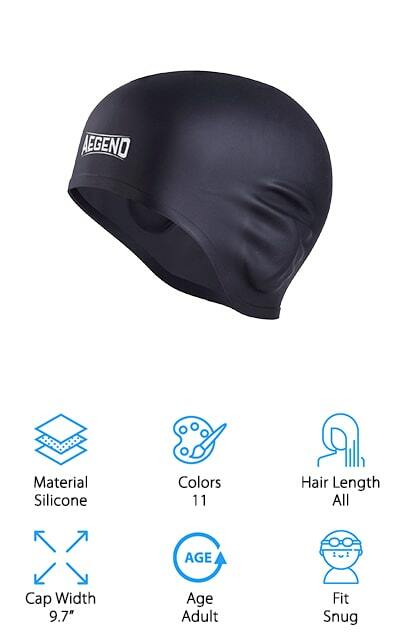 This solid swim cap by Aegend is one of the most popular swim caps for long hair that keeps hair dry. You know the struggle if you have curls, long hair, thick hair, or dreadlocks. 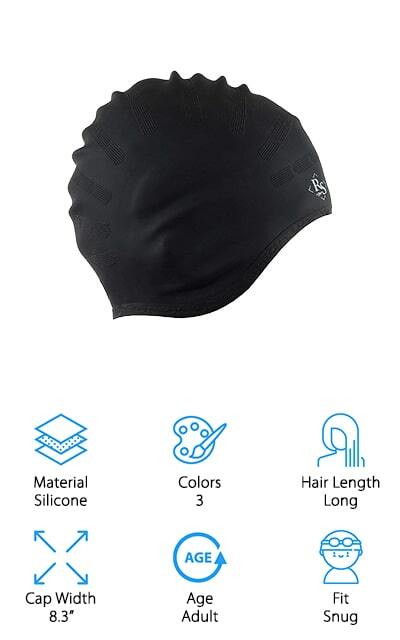 It’s almost impossible to find a swim cap that’s going to keep all of your hair tucked away and dry while you’re swimming, even if it’s just recreational swimming. This cap can be secured tightly to your head but doesn’t present any pressure, so it’s comfortable to wear while also being effective. There’s a lot of room for long, thick hair and the wrinkle-free design gives you less swimming resistance than some other caps on the market. Plus, we love the ear protection pocket that will keep chlorine out of your ears. Avoid the discomfort associated with swimmer’s ear! The elasticity on this cap is amazing, and it won’t lose its shape no matter how often you go swimming. We love it! 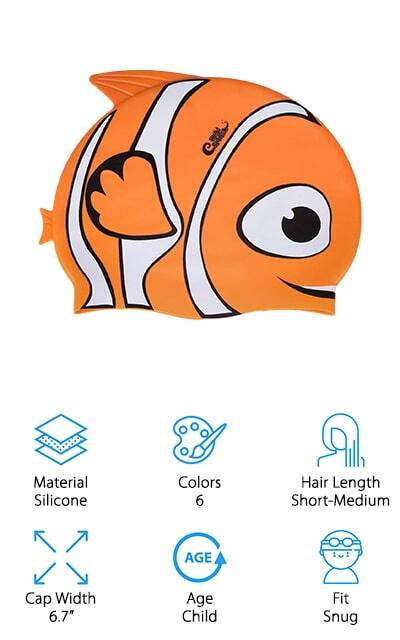 Beemo’s Latex cap is one of the most beautiful swim caps that keep your hair dry. We love that it comes in a variety of colors and shapes, as well as different embossed designs! It’s one of the most feminine caps on our list, and they look vintage as well! There are 37 different variations on these amazing caps! One size will fit most adults, and they are low cut to completely cover your ears. This way they don’t let water or anything else into your ears while you’re swimming. The size and cut of this cap are especially important if you have color-treated hair or hair that is sensitive to chemicals. It won’t get damaged if you’re protecting it with this cap. The latex material allows you to get a comfortable fit that stretches over your long hair, even if you have curls or dreadlocks. You just have to have this gorgeous cap for your swimming adventures! HeySplash makes this silicone cap that’s perfect for kids with shorter or medium-length hair. It’s good for either boys or girls. If your child won’t keep the swim cap on, this is one that might work for you. It’s made of premium silicone, which means that it stretches well and is soft and comfortable. It’s not tight, though it fits snug against the head. It’s easy to take on and off and will make sure that your child’s hair stays dry. It’s got a cartoon design that we love, with different animals printed on them. This is also a great motivator for children to wear their caps. It’s non-allergenic and lightweight as well, so your child will be that much more comfortable wearing it. It’s eco-friendly so you can feel comfortable as well. This is a great cap exclusively for children, and we love that it makes them feel special and fun. It’ll make them want to wear it! Royal makes this great swim cap that’s perfect for keeping all of your long hair out of your way. There’s one hallmark of a great cap: good swim caps keep hair dry. That’s the bottom line. And this is definitely a good swim cap. It stretches perfectly out to the size that you need, including the extra space you need for extra thick hair. It’s made of a high-quality silicone that won’t wear down, and it’s largely tear-resistant so you don’t have to worry about breaking it when you’re putting it on or taking it off. It’s a great comfortable cap that covers all of your hair snugly and won’t let any water in underneath it. Plus, it comes in three colors - a neutral black, dark blue, or pink! This set also comes with matching ear plugs and a nose clip so you can swim in maximum comfort. If you’re a professional, this cap is for you! 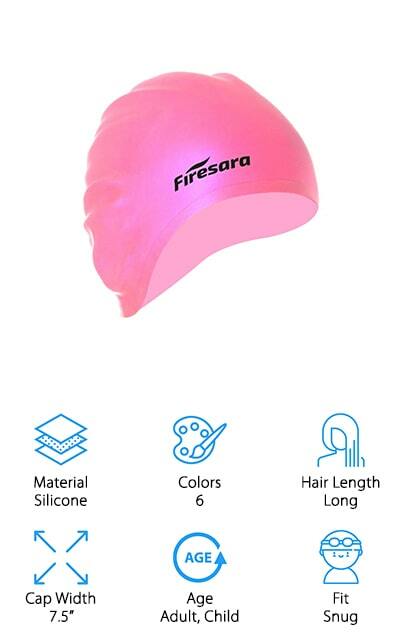 Coming in the final stretch of swim caps that keep your hair dry is this one from Firesara. It comes in six different colors, and you can purchase single caps or a three-pack of different color combinations. The unique part about this cap is that it’s ergonomically designed so it comfortably fits the shape of a human head. You can take it off without snagging your hair, and you’ll still get a tight, waterproof fit when you secure it to your head. Plus, it offers ear protection pockets so that your ears stay dry as well. The elasticity in this cap allows it to stretch to allow room for all of your hair! It comes with a nose clip and earplugs as well so you are completely protected from water while still having fun! Anyone in the family can use it because one size fits all. We think that’s pretty amazing. Great for professional and recreational swimming!